You are the queen of the greatest empire the world has seen, yet you are inconsolable. Your beloved Albert has been dead almost two years but it feels as if he left you yesterday. You have withdrawn to a secluded palace on the Isle of Wight to mourn, yet your subjects still find you. Today it is a group of 18 from one of your most distant colonies. They are dressed in fine feather cloaks, the men with striking designs tattooed on their faces. They say they are chiefs from northern New Zealand and they wish to speak to you of a Treaty signed in your name more than 20 years before. They wish to hongi you, to press noses in a traditional greeting. That is of course out of the question. Instead they perform a mihi, an acknowledgment to the dead. To Albert. Your beloved Albert. Deeply moved, you excuse yourself. You make your way to your chamber to compose yourself. When you return to the audience room you notice one of the native women is heavily pregnant. She tells you her name is Hariata Pikimaui, wife of Hare Pomare. You tell her you wish to be the child’s godmother. If it is a girl she is to be named Victoria; if it is a boy he will take the name Albert. Later you are informed the baby, a boy, has been born in London. His parents have named him Albert Victor Pomare. You instruct your palace seamstress to sew the child a christening gown; you also order a christening set comprising a gilt silver goblet and cutlery. 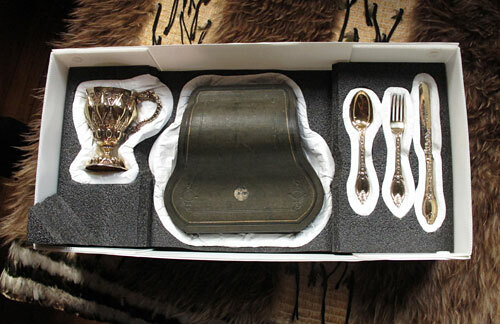 Each piece is to be engraved with the words: To Albert Victor Pomare from his Godmother Queen Victoria, November 1863. For the past 80 years the christening set and gown have been stored in a vault in Auckland. Now it is time for them to come home. 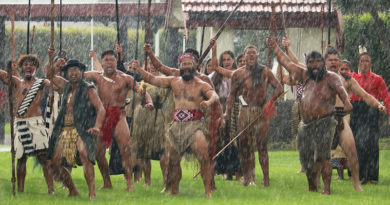 Members of the Pomare whānau (extended family) of Karetu, near Kawakawa, and the Pikimaui whānau of Taiamai, near Waimate North, have gathered by a gate at the Waitangi Treaty Grounds. 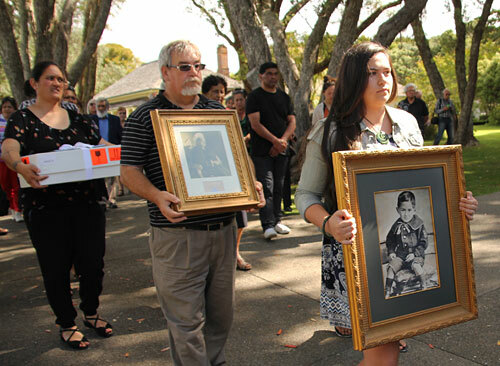 Rangimaarie Painting carries a photo of three-year-old Albert Victor Pomare. 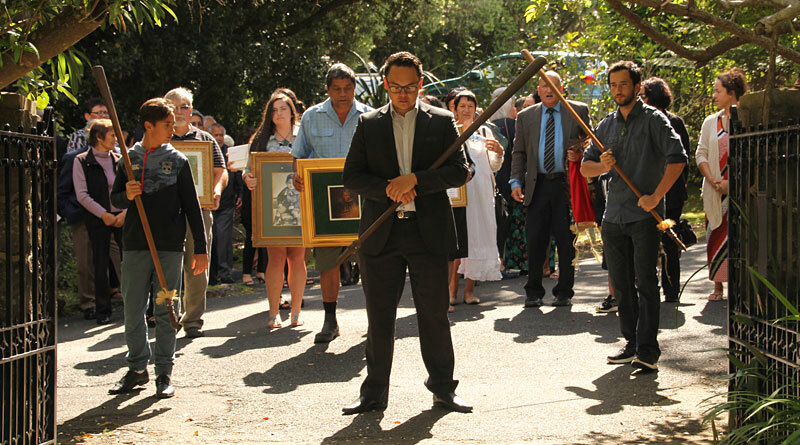 They are led inside by three young men brandishing taiaha (traditional spears); behind them follow descendants of Hare and Hariata carrying photos in gilt frames, a baby’s gown and a box marked fragile. The photographs include a portrait of three-year-old Albert Victor Pomare dressed in a sailor suit and seated on a golden footstool. They are welcomed inside the Whare Rūnanga, the carved meeting house representing every tribe of New Zealand, where the visitors and home people take turns to speak and sing. Bishop Ben Te Haara tells the story of how Queen Victoria came to have a Ngāpuhi godson and blesses the treasures. They are then handed over to their new guardians at the Museum of Waitangi, due to open in time for Waitangi Day next year. A tangible symbol of the relationship between the northern chiefs and the British Crown, the christening set and gown will form one of the museum’s key exhibits. 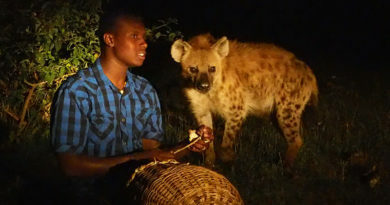 It is time to share the story of the Queen’s godson. Little is certain about the later life of Albert Victor Pomare. It is known that he returned to New Zealand with his parents and was educated at the Queen’s expense in Parnell, Auckland. Waitangi Museum curator Kate Martin says he returned to England as a young man, where his godmother appointed him to the elite Life Guard protecting Buckingham Palace. 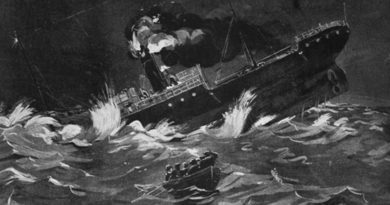 Albert, however, had other ideas and asked to be placed in the Royal Navy — ironically the same navy that destroyed his family’s pā, Ōtuihu, in the Bay of Islands in the Northern War of 1845. He is thought to have died in a shipwreck off the west coast of the United States. His legacy, however, lives on. “It’s a very personal relationship between a queen, a child and a couple of hapū (subtribes), yet it represents something much bigger,” Ms Martin says. Arapeta Hamilton, a hapū spokesman and great-grandson of Albert’s sister, says the child is the embodiment of a “sacred covenant”. 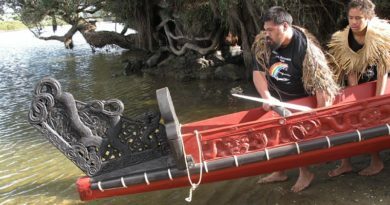 Albert’s grandfather, the chief Pomare II, signed the Declaration of Independence in 1835 and the Treaty of Waitangi five years later — his name is the third one down — so his descendants see the relationship between Queen and godson as the third part of an inviolable pact between the Crown and Māori. The christening set and gown were shared by the Pomare and Pikimaui families until a disagreement in the 1930s. The Bishop of Auckland took the treasures into safekeeping and arranged for them to be stored at Auckland Museum. Discussions about bringing the taonga (treasures) home started in 1983. Their return was the culmination of “a lot of hard work and a lot of talking”, Mr Hamilton says. The game-changer was the new museum, which created a place in Northland where the treasures can be displayed and looked after properly, and where both whānau can be involved. The christening set and gown were handed over at the Treaty Grounds in December 2015 as a long-term loan. The Museum of Waitangi, were they are displayed, was opened by Governor-General Sir Jerry Mateparae in February 2016. The following is a news report about the new Museum of Waitangi, published along with the story of Queen Victoria’s godson in December 2015. 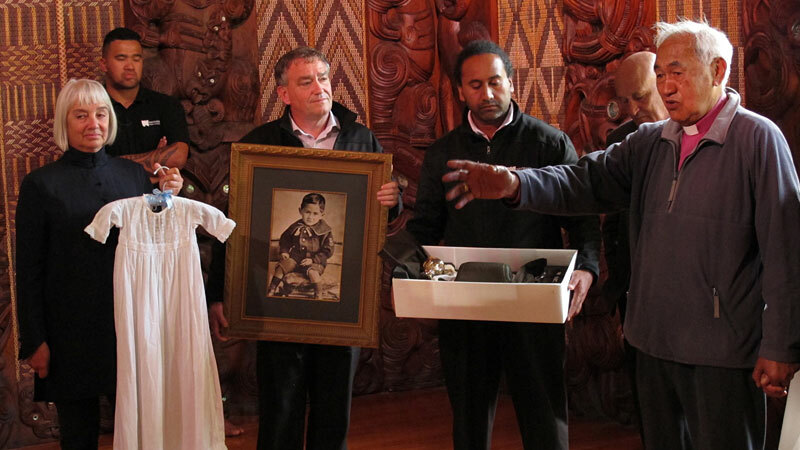 The christening set and gown of Queen Victoria’s Ngāpuhi godson are only two of many treasures arriving in the Bay of Islands for the new Museum of Waitangi. Other exhibits on loan from museums and private collections around the country and as far away as London include a self-portrait by Hongi Hika carved from a tōtara post in 1814, Goldie’s portrait of Tamati Waka Nene and a painting of Hongi Hika and Waikato recording their journey to England in 1820. A 3m-tall painting of Queen Victoria was gifted to the Treaty Grounds by Queen Elizabeth II but until now there was nowhere big enough to hang it, so it was displayed at Government House instead. What you won’t see is the original Treaty of Waitangi — the National Archive wouldn’t let it leave Wellington, saying it was too fragile to be moved — but you will see the only copy in private hands of a bilingual version of the Treaty printed in 1844. It was bought at auction three years ago by a private collector; even Treaty experts didn’t know it existed. After the controversy around the original Treaty the owner of the bilingual version contacted the museum offering to lend it. The new museum is part of a NZ$14 million redevelopment of the Treaty Grounds. The building itself cost about $10 million — paid for by grants from Lottery funds, Foundation North and the Ministry of Culture and Heritage, as well as the trust’s own money — while the main exhibition will cost $3.5 million. The building was designed by Whangārei firm HB Architecture, which has been involved in the project since its inception eight years ago, and built by Henwood Builders of Kaikohe. The ground floor will be occupied by a permanent exhibition telling the story of events leading up to the signing of the Treaty, the day itself and its ongoing effects from the New Zealand Wars through to the present day. The exhibition was built in Wellington by Workshop e, the company behind Toitū Otago Settlers Museum and the Air New Zealand exhibition at Te Papa, and is being assembled on site. Waitangi National Trust chief executive Greg McManus said the heart of the exhibition would be the documents room displaying facsimiles of the nine Treaty sheets. Technology would feature strongly with touch screens and an interactive table. “But we only use technology if it enhances the story. I don’t believe in whizz-bang technology for the sake of it,” Mr McManus said. While the Treaty could be a controversial and divisive topic, the exhibition would be based on facts and evidence, not opinion. Scholars such as Claudia Orange and the trust’s own Kate Martin had helped shape its content. “It’s not a museum’s job to tell people what to think,” he said. One of the museum’s aims was to encourage tourists to stay longer in the Bay of Islands, which would benefit everyone in the North. It would also provide a much-needed wet-weather attraction. More important than that, however, was giving New Zealanders a greater insight into their own history. Mr McManus hoped the exhibition would break down some of the preconceptions around Waitangi, most of which were formed by a few minutes of TV coverage each year as politicians arrived at Te Tii Marae. “Many people react negatively to the word ‘Waitangi’ but when they actually get here their views change completely. The point is to arm people with a little more knowledge. 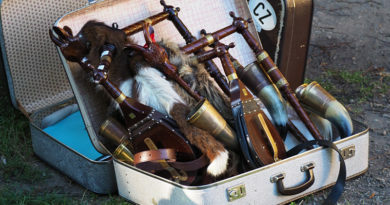 I want people to leave Waitangi as better New Zealanders,” Mr McManus said. The museum’s first floor will include an education room and space for temporary and touring exhibitions. The first such show will feature 50 large-scale images by four top photographers from past Waitangi Day celebrations and protests. Mr McManus said many locals and Waitangi Day regulars would see photos of themselves that hadn’t seen the light for 30 years. Dutch-born Ans Westra in particular focused on the human face of Waitangi, such as the workers in the marae kitchen, rather than ceremony.